We’re talking today with Jessamyn Farrell, Assistant Director of Shining Hope Farms in Mt. Holly. GA: Jessamyn-tell us what is Shining Hope Farms? Jessamyn: Shining Hope Farms consists of two therapeutic horseback riding facilities that serve individuals with disabilities. We’re part recreational farm, part rehab clinic, and part refuge for families who are taxed from the challenges of being a family with a child with special needs. Our goal is to work tirelessly to change the quality of life of our community members with disabilities and their families. Our original and primary location is in Mount Holly and we added a satellite location in Charlotte in 2010. GA: What population do you serve? Jessamyn: We serve individuals with disabilities, with a focus on pediatrics. The disabilities are primarily physical and intellectual, such as cerebral palsy, Down syndrome, and autism spectrum disorders. We also have a heart for the impoverished members of our community and one of our goals is to ensure that our programs are affordable and accessible to the poor and needy in our communities. In fact, 37% of the participants that we serve at our Gaston County farm are below 200% of the poverty line. This is in a county where 50% of the children aged 5-17 with a disability are living in poverty according to the annual American Community Survey. Most people wouldn’t know this, but North Carolina has been ranked as the 5th costliest state to have a child with special needs. So these are families that can use all the help that they can get, and with everything we do, we keep that in mind. 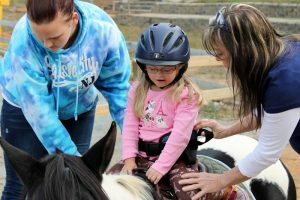 Jessamyn: We offer motivational, affordable, and outcome driven, rehabilitative and recreational services through our two main programs—our Therapeutic Riding Program, and our specialty, which is our Hippotheray Program. Our Therapeutic Riding Program gives participants the opportunity to learn goal-oriented horseback riding lessons and horsemanship skills from a certified riding instructor. We also have a Special Olympics program that is a sort of subprogram of the Therapeutic Riding Program, and is also open to outside riders. Our annual Regional Special Olympics Equestrian Show is coming up on June 25. Our Hippotherapy Program on the other hand is an insurance billable medical service that consists of physical (PT), occupational (OT), or speech therapy (SLP), conducted by board certified, licensed therapists, that are specially trained to use a horse as the main treatment strategy. It’s something that is incredibly high demand because of its outcomes, and unfortunately isn’t all that widely available or accessible around the country. 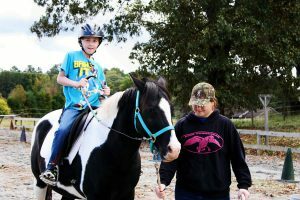 We’re the only facility specializing in Hippotherapy in the metro area, which is evidenced by the daily calls we receive from families wanting to enroll their child (or sometimes children) into the program, and the fact that we have some families that travel hours round trip to attend their weekly session. Unlike other programs around the country that offer this service we do not charge an “equine fee,” for the use of the horse in therapy. We just bill your insurance, just like if you were going to a regular outpatient clinic, meaning it’s essentially free for our patients with Medicaid (the majority of our patients). Aside from the affordability of the program, the outcomes are just astounding. The horse is a treatment tool like none other. While we have and use a clinic in conjunction with the horse, you often need to go from one machine or activity to another to target different outcomes. The horse is capable of helping a child work on so many things simultaneously. GA: Tell us about your staff…do you need volunteers? average, three people are directly required to put on just one session for one child. Considering we serve over 160 a week that means a lot of people are involved (which is why we currently have a paid staff of part-timers including nine therapists, an executive director who is a full-time volunteer, and a roster of other dedicated volunteers). Depending on the program, two of the three people involved any given session are either a certified riding instructor and/or a licensed therapist, but we do our very best to make sure that last person is a volunteer. That volunteer serves in the role of “side-walker,” someone who walks alongside the horse and child and is a sort of safety net. Outside of these three direct service people, we of course need people in the barn helping with the horses and the overall barn operation. We also need help with maintenance, office tasks, and special events. The need for volunteers is never ending! Luckily, the interest and support from the community in this area has been amazing. GA: How did Shining Hope Farms get started? Jessamyn: Our founder and Executive Director Milinda Kirkpatrick’s life experience seemed to unknowingly prepare her for this endeavor long before it was a reality. Growing up she owned a horse, which she used for delivering newspapers in Charlotte. She also had a Dad and later on a nephew with disabilities. When her children were small they became interested in horses and they ended up volunteering at Charlotte nonprofit that was considering offering therapeutic horseback riding. Despite the fact that she was previously unfamiliar with therapeutic riding, she felt her life experiences leading up to this point had prepared her to help this type of program get started. After becoming a certified riding instructor through the Professional Association of Therapeutic Riding, Intl., she was able to get a small pilot program off the ground and was astounded with the results she was seeing. Unfortunately, not too long after the pilot program took off, the founders of the nonprofit where the program resided, abruptly announced that they would be moving and the nonprofit would be shutting its doors. 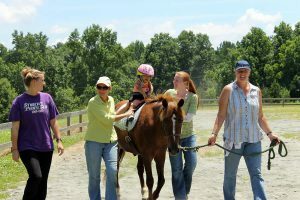 Not wanting to abandon the families in the program, Milinda and her family put their Charlotte home on the market and started looking for an equestrian site where they could found a new nonprofit to serve the families. They eventually bought a dilapidated foreclosure in Mt. Holly that had a barn and stables, albeit ones in desperate need of repair. Shining Hope Farms, as it came to be known, was officially incorporated in 2002 and over the next few years the Kirkpatrick family worked tirelessly to renovate the property. They were encouraged by the fact that the Gaston County community welcomed them with opened arms, evident through physical and monetary help that they received including grants from the Community Foundation of Gaston County and the Glenn Foundation. GA: What are some ways folks can plug in, either to volunteer or make donations? Jessamyn: Whether someone loves kids, animals, or just being outside, we’ve got a place for them as a volunteer. We also love getting people plugged in with special skill sets that they might not think could be useful, but they are! For instance, we love using volunteer photographers and videographers. I got an email this week from a contractor who wanted to volunteer with his daughter and offered to help with maintenance. That guy doesn’t know the extent of the celebrity status that will be bestowed upon him once he starts volunteering at the farm. And of course, we love, and need donors. Our donations range from planned giving, to monetary donations to mundane but really useful things like cleaning supplies, tack, farm equipment and more. You might be surprised to find out we actually don’t own a tractor. We have two farms and no tractor! We work so hard to make as much of every penny we have go towards our programs, which is why even these “mundane” donations are so incredibly valuable. We’re also always looking for new board members.